Darren McGavin died yesterday. A fine actor with, according to IMDb, 173 roles to his name, for me he will always be remembered as the irascible and forever exasperated newspaper reporter Carl Kolchak. Though the series that bore his character’s name, Kolchak: The Night Stalker, was as short-lived (only 20 episodes) as the creatures of the imagination he outed, McGavin nevertheless managed to help create one of TV’s most memorable personae. 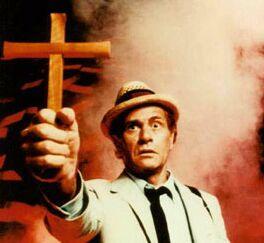 Based on the terrific 1972 Movie of the Week The Night Stalker, which was masterfully adapted (from Jeff Rice’s novel) for television by Richard Matheson, and an inevitable — and inevitably inferior, but still fun — sequel (The Night Strangler) the following year, Kolchak: The Night Stalker wasn’t so much a good TV show as it was a showcase for a couple of great characters (Kolchak and his long-suffering editor Tony Vincenzo (Simon Oakland, who was doing double-duty from Toma, where he was Tony Musante’s long-suffering boss) and the actors who portrayed them. McGavin and Oakland’s confrontations set the stage for wars of the words a few years later with another pair of newspapermen, Joe Rossi (Robert Walden) and his boss Lou Grant (Ed Asner). And Chris Carter cites the show as a chief inspiration for his series The X-Files, which more often than not managed to rise above Kolchak‘s new-monster-every-week formula. But ultimately it was McGavin as Kolchak that made the show shine. Like Don Knotts, he took a character off the page, made it his own, and this weekend took it to his grave.